Beer bottle carrier cardboard is perfect for most glass ball ornaments. I have bad luck keeping the manufacture boxes in great condition, over time they break. 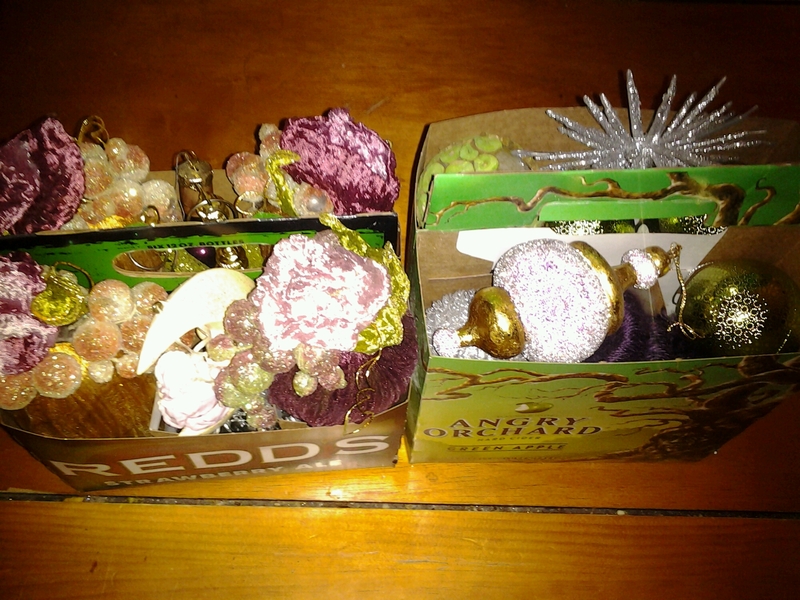 This is a solution so that and they sit nicely in your Christmas decoration boxes/totes neatly. Win win! 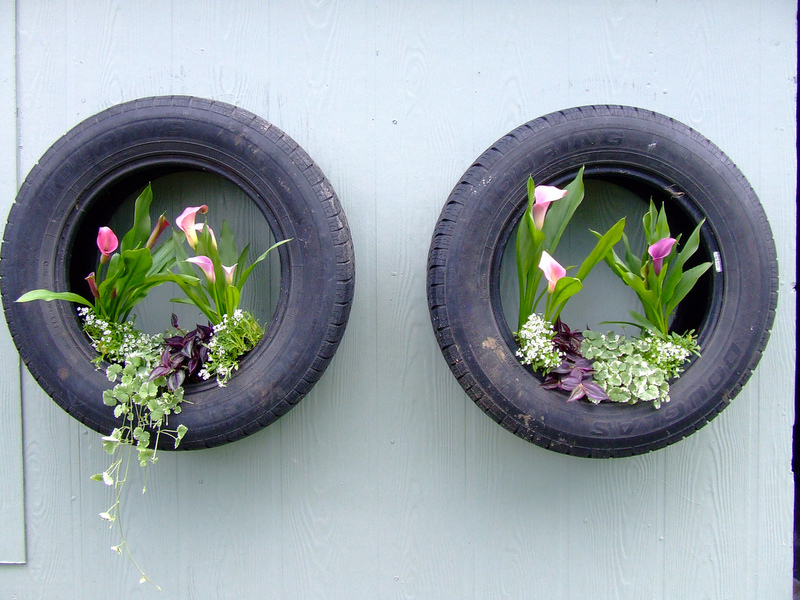 Recycle, re-use! Happy holiday clean up! The beginning of this year I put a blog tutorial on my brown paper bag flooring technique. I’ve had some great responses to this and have had people send pictures of their completed projects using my technique. This is so exciting. It blows my mind in such a major way. I ponder it all the time. Thank you for the responses and amazing shares from your projects, I appreciate the feed back so much. It’s in part why I took the time to share. I love finding things that inspire me, and so that if I can inspire people, it’s just all good! Ok, so in May I completed the largest art project I have ever done. It truly was the largest art floor to date! 1,300 square feet church sanctuary. The floor was in horrible shape, and because it’s an historical building there was not much we could do to level it. The church had left it bare concrete with hideous cut back from a previous flooring. As soon as we started going to the church as parishioners I knew we had to do something about the floor! Acoustics were terrible, the “coolness” of the decor was lost with the bad floor. So I approached the staff and all agreed. They gave me creative license, lol oh boy! Here is what was come up with as the option to hide a buckled, heaved and uneven floor. dipped and dried paper tiles waiting! I love the way the light shines through the windows. This is going to be a short tutorial on how to make a Christmas tree skirt out of plastic bags. The plastic bags you get from shopping. So don’t throw them out. Plastic bags, think ahead and plan so you’re getting the colors you want and saving them. You want to set your iron at the 3rd heat setting. Be careful not to let it sit in one place to long. 1. Cut the logo from the bags and set aside to use later if you need part of the logo. 2. Cut the design components out. 3. 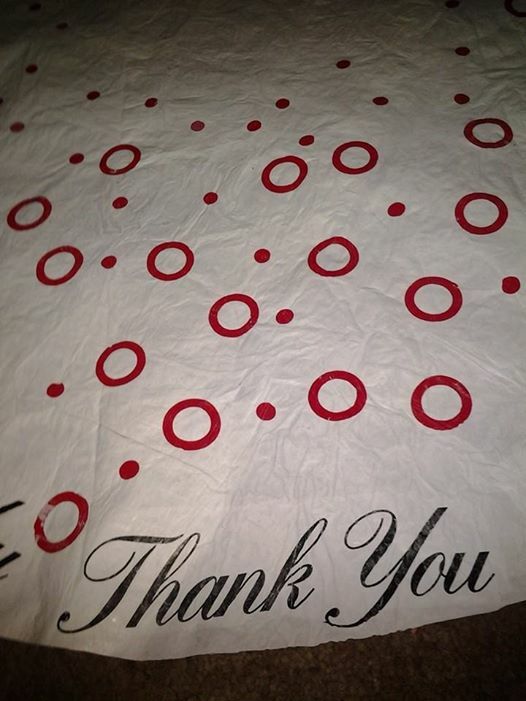 Lay a folded sheet or something you can use to iron on. 4. Line the folded sheet with a layer of wax paper large enough to hold the plastic. 5. Layer the background of the plastic, in my case it was white, I had about 5 layers of the background plastic. 7. Run the iron over the entire thing briefly, you want the layers to be together enough to proceed with the next steps. You don’t want to iron as though you’re finishing yet. 8. Carefully peel one side of the wax paper off, this will be the side you apply your design components too. 9. Flip the piece over and on the side that still has the wax paper, draw a circle the size you need it, in my case I used a cardboard disc from a paper mill as my guide, the disc is HUGE. 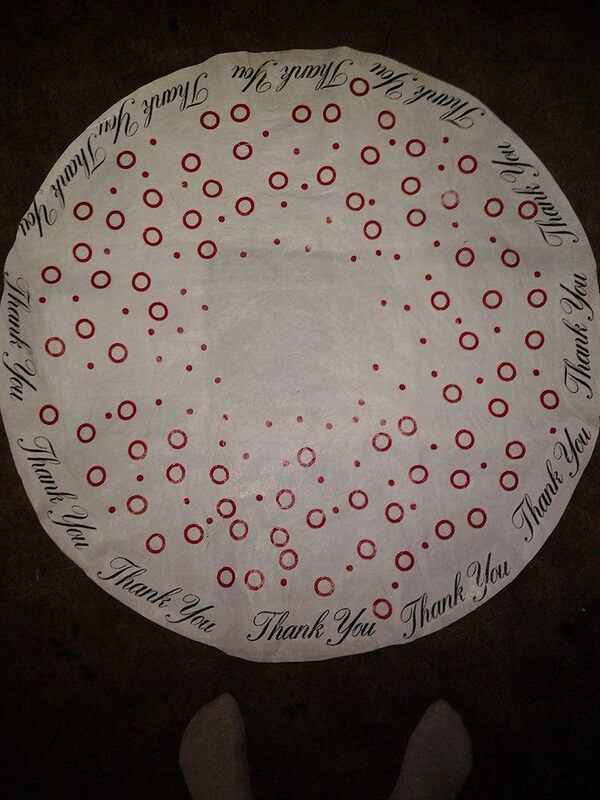 Anyway, mark and cut the circle the size you need. 10. Now that it’s cut into the circle, keep that wax on the bottom, flip the piece over again and start placing the design pieces. 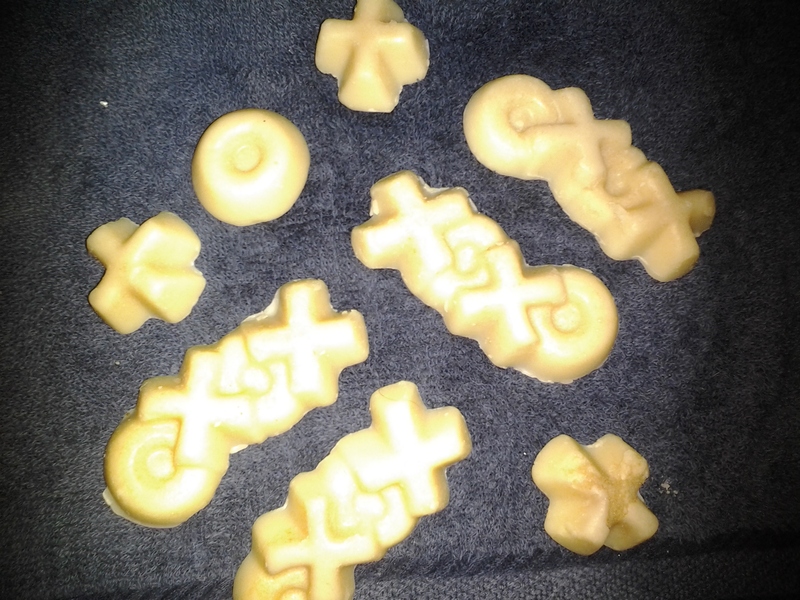 Once you’re done placing the design, put the wax paper you carefully took off back over the plastic, carefully, the whoosh of the wax paper going down may move your plastic pieces. 11. Iron over the entire piece again, this time you will make sure it’s all stuck in place and solid. Turn the piece over and iron the other side also. 12. Allow to cool then peel the wax paper off and VOILA! Christmas Tree Skirt. Cut your slit and your stalk hole and it’s the coolest! Hello Kitty apron 1950’s inspired. Grandaughter sporting her ZOMG tee I made. My husband mounted these to the outside garage wall in our backyard, he used anchor bolts drilled through the tires and into studs. I then added organic soil and a spray of favorite plants. The issue I have found is that it needs watered frequently in the spring and summer months, so easy idea is to take a 2 liter bottle and drill a hole in the lid and then fill with water, bury the top of the bottle in the soil and it will water slowly, just keep checking the bottle water level. If Plastic isn’t your thing, then drilling a hole in a cork and re-cork a water filled wine bottle and it’s a classier water dispenser. I refinished a table I got for free on Freecycle, which was ugly and needed to be covered to hide it. So I changed it. Sand paper, 180, 220, 400, 600 grits. Vibrating sander or an orbit sander, which was quick work of sanding and a sanding block for the finer grits. Color of your choice flat house paint, I used primer for mine. Stencil of your choice. Painters tape. Stain, applicator, gloves and wiping rags. Sealer, either spray or brush on, if brushing use a good brush. Spray paint for chairs and legs of table. Sand the top to the wood, make sure it’s clean and naked as the day it was made. Just the top needs to be to the wood unless you’re staining it all, I chose to paint the legs. Sand smooth. What you’re painting, such as the legs, you just need to sand dull. It does not need to be naked. This is when you will use your 220 grit paper. 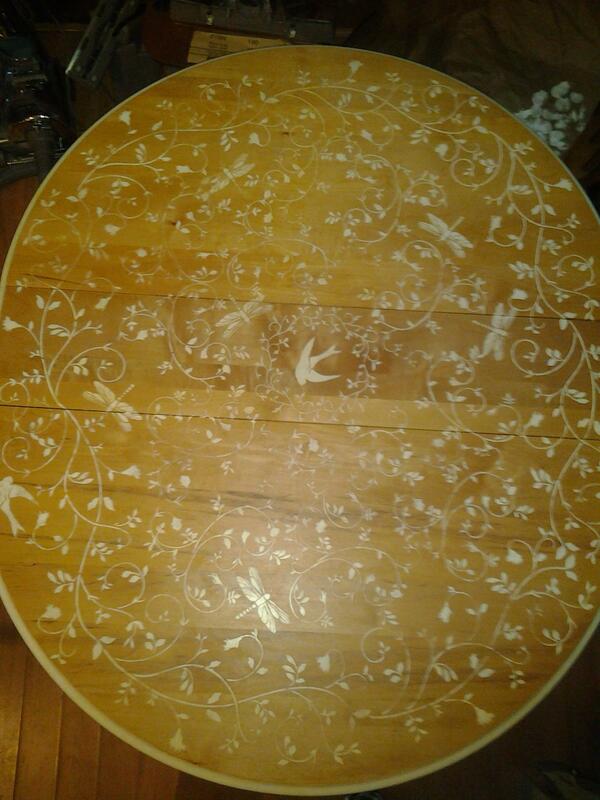 Clean all the sand paper crud off and begin to apply the stencil. I taped my stencil down with painters tape. I also used a brown paper bag to dab my dipped sponge out until it’s a bit dry. Dab the paint into the stencil, make sure it’s not to wet or it will bleed. 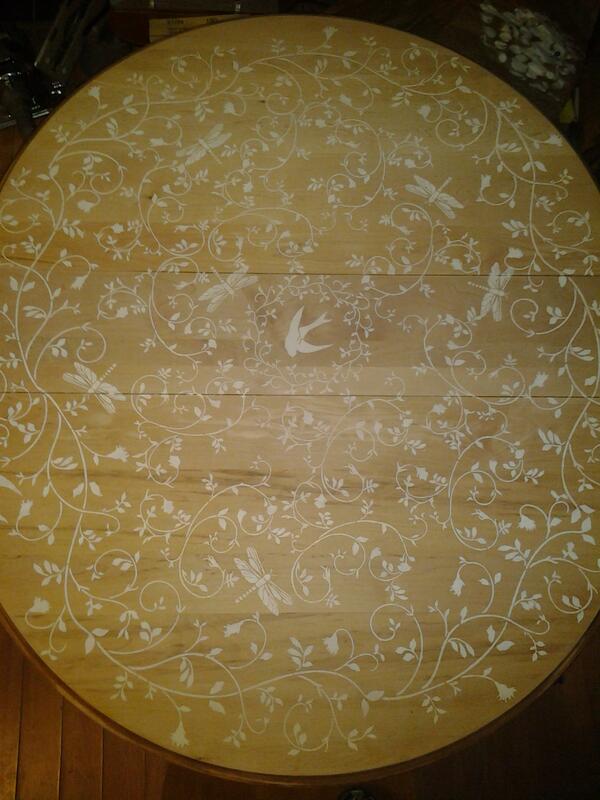 Let it dry and and move on to the next stenciling area. I used my hair dryer to flash dry, I am impatient. 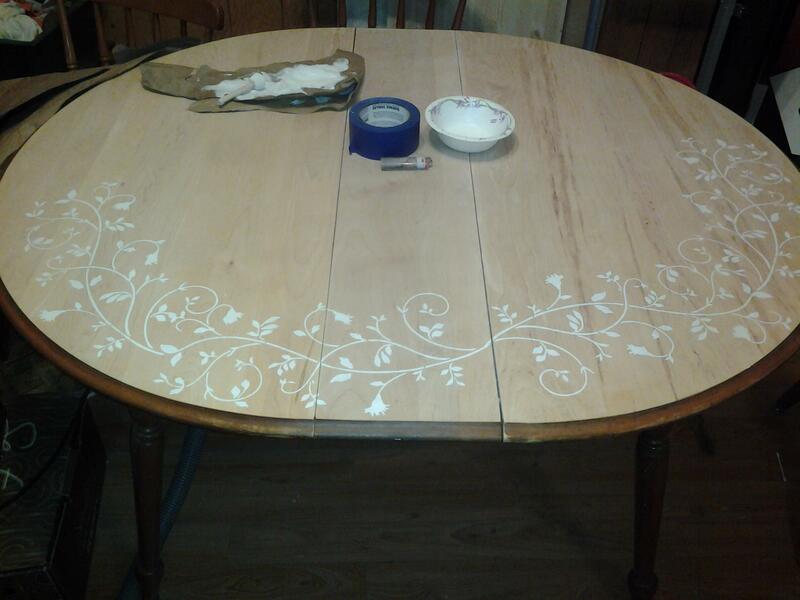 Complete the stenciling and then step back and relax while it all dries. 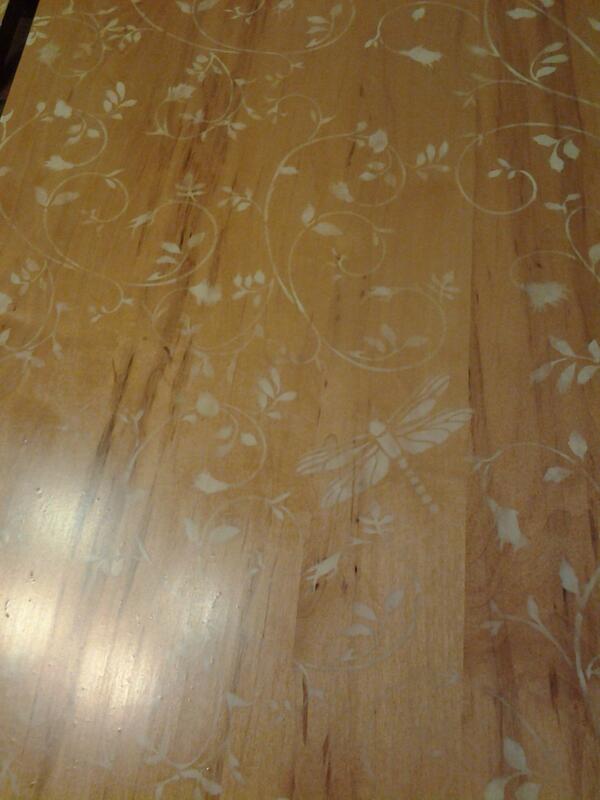 Now come back the table and used the 220 sand paper to sand the paint edges down smooth. I also took this chance to sand paint thinner in various areas for an antiqued look. 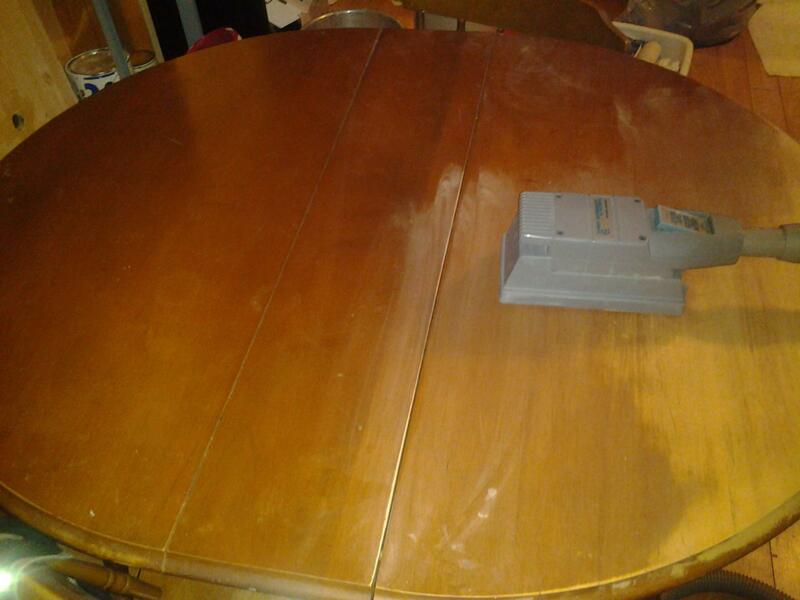 Clean the table off again, make sure it’s super clean, do not use a damp rag, just dust it, vacuum it if you have a fancier attachment for that. Before I sealed I did a fine grit sand to knock off any imperfections I didn’t want coming through the sealer surface. So do that if necessary. The sealer can be sprayed or brushed, I brushed mine on and had problems with bubbles, so I ended up having to put a fine fine grit sand on the first coat of sealer so my second coat would be the finish. So this is that point, apply the sealer, allow to dry for the time indicated (every product is different) then reapply until you’re happy with the finish. Note: You will have to do a light 600 grit sand on the finish between applications, its important to do this. Allow to dry and voila, artsy farsty place to congregate as a family for dinner and stuff!